Home » Cheap and Good? 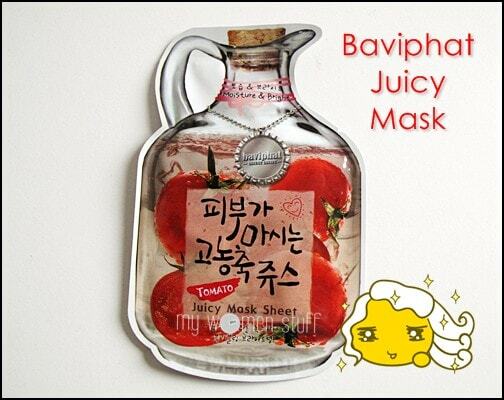 » Baviphat Tomato Juicy Mask because Tomatos are good for you! 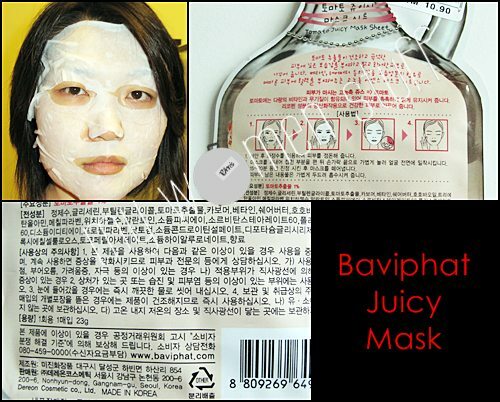 Baviphat Tomato Juicy Mask because Tomatos are good for you! When I purchased the Baviphat sheet mask, I was told there are 2 types – the ones with beans and the ones with fruit and vegetables. Beans?! Anyway, I opted for the Tomato Juicy Mask sheet. Packaging looks funky and thankfully, although there is a faint fresh scent like that of freshly cut tomatoes, the scent wasn’t too strong. The mask comes folded up into a tiny square. Quite odd, considering the packet is quite large. It is also sticky. Super sticky!!! The mask is a regular sheet mask with the holes cut out in all the right places. It fits my face well. Maybe because its an Asian brand and thus fitted to Asian faces. I did find it well soaked in the sticky gooey essence. I was told to leave it on my skin for only 15 minutes and no more or the benefits will be lost. I’m afraid I didn’t pay much attention because I was doing something else while using the mask and only remembered to take it off about 20 minutes later. My face felt sticky. I did pat in most of the essence but it still felt rather icky. When it dried, my skin felt a little tight. I did follow up with my regular night care routine. One thing I did notice immediately upon taking off the mask is that my skin did look significantly brighter and looked more moisturized. I’d been travelling up and down the country for work and what with the World Cup on, I’d been getting dry patches on my skin which this mask helped keep away immediately upon using it. I don’t think this mask is any better than any other sheet masks I’ve tried. I did not like the gooey texture – I prefer something that feels less sticky and I wasn’t quite sure about that instant brightening of the skin – made me feel a little sceptical and not a bit worried. I might try the other types or maybe the one made with beans extract. Seems to be popular. PrettyBeautiful doesn’t think much of it though and I do trust her view on this so might just skip it. At RM10.90 a piece, its quite expensive for a one time only indulgence anyway. Have you gone to check out the Baviphat counter yet or maybe you have tried their sheet masks before this? izzit have the store at sungai wang plaza? ?and at sungai wang thr have enough product same v pavilion?? just came back from seoul. I bought the mask at RM30 for 10pieces..huhu…super cheap!! !